It’s been a while since BACK-ON has released a new album or single, which is not surprising given the departure of Icchan, the band’s drummer, in October 2011, as well as KENJI03 getting together with KODA KUMI. This situation may change however, as CDJapan is hinting that a new two-track single called Ice cream may be released on May 9th 2012! In the meantime, the band have written a song called タビダチノウタ (Tabidachi no Uta) or “Departure Song” (Tabidachi means “setting off (on a trip)”) for the debut album of the 7-member Japanese boy band Kis-My-Ft2, who are also part of the same record label (Avex Trax. ; as with all BACK-ON‘s songs – the lyrics are credited to TEEDA and KENJI03 and the music to the entire band. 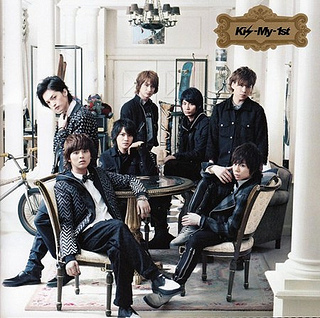 The album – titled “Kis-My-1st” – was released just last week (March 28th 2012) and has already topped the Oricon weekly chart with a record 254,000 copies sold in its first week. It is a significant milestone, as this is the first time – in 6 years – that a male artist (group and solo) has sold over 200,000 CDs in their first week; the band’s latest single SHE! Her! Her! also went to number 1 last week in the singles chart. You can find the romanised lyrics for the song and the rest of the album at Twilight Paradise Lyrics. The original lyrics have been posted by Beautiful Mirai. What do you think of this song? Let us know here by using the comment form below or you can join our discussion thread on the Forums!